This post is a Q&A about my project for NaNoWriMo. Q: Who are the characters? A: There are three main characters; Amy, Mart and Campbell. Amy is a travel writer in her late 20’s. Mart is her openly gay flatmate. Campbell is the guy Amy has an affair with. Q: Are the characters based on anyone from real life? A: Well, yes and no. Amy has experiences similar to my own but right now she’s nothing like anyone I personally know. Campbell has similarities to people I know, and some aspects of his life (mainly career) are things I had to ask people I know in order to research. The idea of Campbell has basis in reality, although the character doesn’t. Mart is an amalgamation of all my gay male friends- they’ll definitely see parts of themselves in Mart (only the good bits though!) Mart is the comic relief, the epitome of the lighter side of life. He’s my favourite character to write. A: My friend Katariina told me about NaNoWriMo last year… on Halloween. I promised myself I’d do it this year so I registered early and got things together. I had no idea what I was going to write until about a week before it started. I had a vivid dream involving the basic plot and some scenes. I wrote it all down when I woke up, then formed the synopsis around it. Once November 1 came around, I started writing and it just flowed. The story has elements of my life; for example, I went to Bali last year over Christmas/New Year for a friend’s wedding, but the actual affair bit is pure imagination. A: At work during quiet moments or on my laptop at home. I’m constantly emailing copies of the draft to myself so I always have the latest copy nearby. Plus I have a notebook in case anything pops into my head at other times, like when I’m out walking. Q: What will you do with it once NaNoWriMo is over? A: No idea! 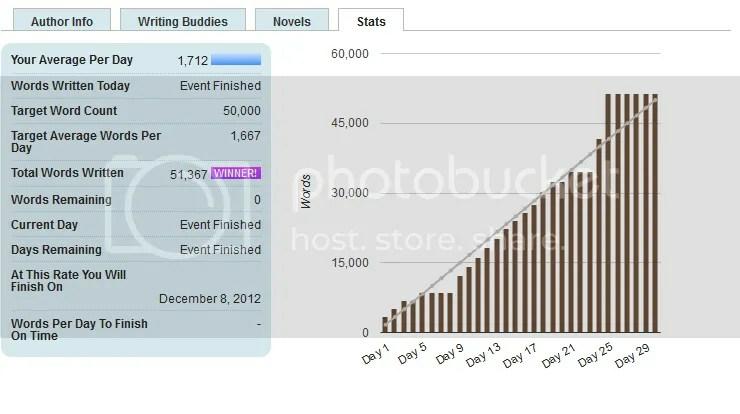 Lots of novels started during NaNoWriMo have been published and have been successful. Water For Elephants by Sara Gruen is just one; they’ve filmed it and the movie will be released next year. While that’s obviously a lovely dream, to be honest I’d just like to finish writing the novel before I decide what I can do with it. Q: How have you found the process? A: Easier than I expected, actually. 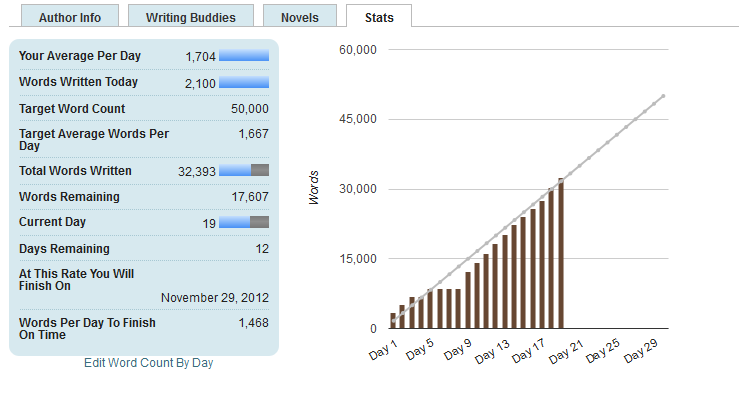 The goal is to write 50,000 words in the month of November. That’s 1667 words a day, or about four A4 pages. I write longer emails than that, so I knew I could do it! So far I’ve missed only two days, but I’d like to get at least some writing done every day. I told everyone I know that I’m doing this, and everyone has been really supportive.